LAWRENCE — On Wednesday, March 14, the Lawrence and University of Kansas communities will have a chance to come together to learn about two people whose lives and work have affected the way that the world thinks about food production. The first film features Wendell Berry and will begin at 5:30 p.m. The second film profiles Dolores Huerta and begins at 7:15 p.m.
“Look & See: A Portrait of Wendell Berry” is based in Henry County, Kentucky, the home of novelist, poet, environmental activist, teacher, cultural critic and farmer Wendell Berry. Throughout his life, Berry has espoused the simplicity, land stewardship, sustainable farming, and connection to place, and his writings have reflected this in his unique and deliberate voice. Directed by Laura Dunn and Jef Sewell, “Look & See” weaves scenes of agrarian life with interviews with farmers and community members to tell a story of Berry and the place he calls home. “Dolores” profiles Dolores Huerta, arguably one of the most important activists in American history. In 1962, Huerta co-founded the first farm workers unions with Cesar Chavez, and until today, her enormous contributions have received little recognition. Huerta led the fight for racial and labor justice alongside Chavez, becoming one of the most defiant feminists of the 20th century. Directed by Peter Bratt, “Dolores” reveals this seminal figure to audiences in a new way. “As part of its mission to foster conversations across the arts, sciences and humanities, The Commons has prioritized food systems research, an undeniably interdisciplinary and important field, in its programming. 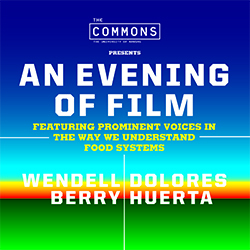 This evening is an opportunity for the campus and larger community to learn about the lives of Wendell Berry and Dolores Huerta as well as a number of local initiatives that champion food production education and justice,” said Emily Ryan, director of The Commons. The Commons, in partnership with the Environmental Studies Program, the departments of American Studies and Sociology, the Natural History Museum, the Center for Sustainability and the Sunrise Project, will screen both films at this free event. The evening will also include donations from local businesses as well as information about how to get involved in food systems work in the Lawrence community. Tickets are available at Liberty Hall or thecommons.ku.edu.